Bacteria have been steadily shedding their former image as amorphous sacks of protein with simplistic, individualistic life styles, and one of the newest surprises is that these complex community-dwelling organisms also have a sense of identity. That’s a discovery by Assistant Professor Karine A. Gibbs, the newest member of the Harvard Department of Molecular and Cellular Biology (MCB) who studies how bacteria segregate themselves into different populations. “It fascinates me that there is some fundamental process that allows a cell to say ‘you are different than I am.’ We find it at all levels of organisms from the smallest bacterium to the most complex organism,” says Gibbs. She hopes to someday watch how genes turn on and proteins move about in individual bacteria in one population as they meet other populations. How does a cell recognize other populations as the same or different, and how does that change its behavior? Such scientific curiosity came early to Gibbs. Born in Jamaica, she and her family moved to Maryland when she was young. Her parents sent her to summer science camps where she made things like solar powered toys, and a high school biology teacher encouraged her to apply for summer programs at universities and government labs in the area. She spent one summer at Villanova University and the following two studying Hantaviruses at the US Army Medical Research Institute of Infectious Diseases. By the time she enrolled in Harvard as an undergraduate in 1996, she already admired the ingenuity of microorganisms. She recalls the “fantastic” Molecular Biology course with MCB’s Richard Losick – “I may still have the course book with his notes in my basement” – and a fun seminar on bacterial circadian rhythms with Woody Hastings. After Gibbs decided to major in biochemical sciences, her academic advisor suggested she do research with Roberto Kolter in Harvard Medical School on biofilms, the slimy colonies of bacteria that form on surfaces and that cause, among other things, antibiotic-resistant infections on implants and medical devices. 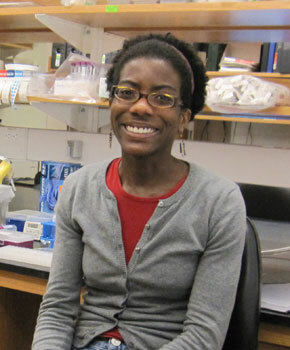 Gibbs gave up competitive track and field – an injury had prevented her from playing her favorites, lacrosse and field hockey – to study bacteria’s twitching motility in the early stages of microcolony formation. “They grow a limb (a pilus) by stacking together polymerized proteins like a lego chain, and then they throw and yank, throw and yank to propel themselves along a surface,” Gibbs explains of this work that led to a paper in the Journal of Bacteriology. For graduate studies in Julie Theriot’s lab at Stanford University, she switched from looking at bacteria on surfaces to the proteins on the surface walls and membranes of bacteria, looking at how these proteins move and how that movement correlates with the bacteria’s life cycle. Then Gibbs herself moved, to pursue post-graduate studies with Peter Greenberg at University of Washington, Seattle. There, she and her husband enjoyed skiing, and she began working on “the coolest bacteria ever,” Proteus mirabilis, a “kissing cousin” to E. coli that can form biofilms on urinary catheters and so costs millions of health care dollars in fighting these resistant infections. The Proteus population forms a bull’s eye pattern as it advances and rests. Remarkably, two different strains of these swarms will segregate themselves. “A line literally forms between two populations, creating a barrier. But if the populations are the same strains, they merge,” Gibbs says. Since 1946 when this segregation was first observed, scientists tried and failed to explain it. Many scientists thought the secret to those boundaries lay in the different toxins and anti-toxins that each strain makes to conduct their biological warfare. But Gibbs believes the toxins are a red herring. Instead, the lines form because of the activity of a novel set of five self-recognition genes that she and a collaborator in Greenberg’s lab identified. They called these gene ids for “identification of self.” Two of the proteins encoded by these genes appear to act as bar codes for self-identity and the other three operate like a checkout scanner reading the bar codes. Ten years from now, she hopes to use communities of bacteria as a model for understanding more complex communities of cells. What are worms, fish, mice or even humans but many cells working together to make that organism? In bacteria, one cell is one organism, but it works with other cells to cause multi-cellular behavior, such as is seen in the biofilms she studied in Roberto Kolter’s lab. “I’m interested in how that relation to the community comes about,” she says. Gibbs says that starting in high school, she basically just followed the recommendation of a series of “awesome mentors,” and she wants to pass that favor on to a new generation. As a Harvard undergraduate, she participated in the Phillips Brooks House Association Experimenters program, teaching science in Cambridge elementary and middle schools. In graduate school she worked one-on-one with undergraduate students. Now as a Harvard faculty member, she wants to help students to become more confident about themselves and to discover what is truly fulfilling for them. She also gets something back, she says. “Seeing science through their eyes reminds me how exciting it really is” – as if she needed more enthusiasm.